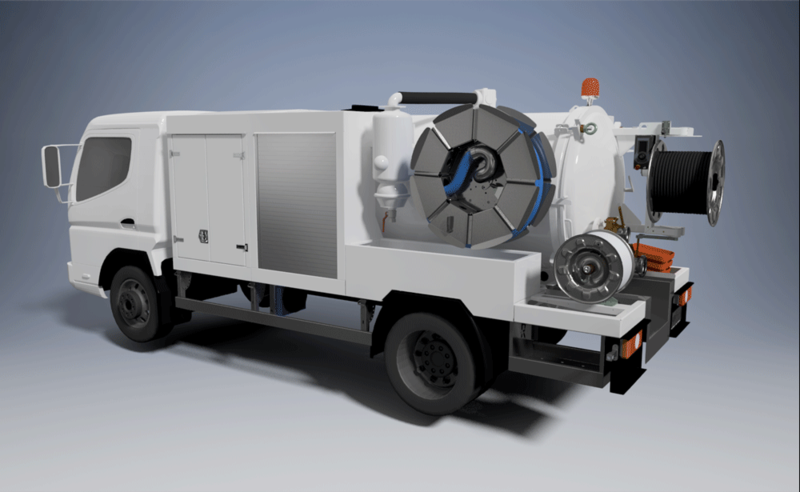 Drain and sewer cleaning equipment manufacturer Rioned has announced the launch of a new 7.5 tonne JetVac Combination Unit. The new unit has been built to meet new emission standards by featuring a PTO (Power Take-off) drive that uses power from the vehicle engine to operate the pumps. The new units are being built on a Mitsubishi Fuso Canter chassis featuring a Euro 6 turbo-charged, direct-injection engine with more BHP for a better driving experience. Rioned chose the chassis for several reasons, but chiefly because previous bespoke PTO projects utilised the Mitsubishi engine with great success. Rioned has long been a forerunner in the production of PTO technology and the new unit will go into Euro-wide production in 2019, with 20+ units expected for the UK market over the course of the year. The prototype unit has already been sold to a UK customer with delivery scheduled for the first quarter. The 7.5t combi is a popular choice with drainage contractors and utility companies because of its manoeuvrability in urban areas with limited access. The vehicles can also be driven without an HGV licence by anyone who passed their test before 1997. Many features of the new unit are comparable with the company’s other 7.5t combis, including a tank capacity of 3,000 litre tank, partitioned to hold 2,000 litres of waste water and 1,000 litres of clean water, with a mechanical tank level indicator to indicate waste level. The hydraulically operated hose reel pivots 180° and includes 100 metres of high-pressure hose powered by a P52 pump. Stage V of the new EU emissions regulations come into effect in 2019, which also coincides with the introduction of low emission zones across major European cities. In 2020 London will create the world's first 'Ultra Low Emission Zone' with non-road mobile machinery (NRMM) Stage V regulations applying to all sites in Greater London and contractors working within the zone required to register equipment. As the new combi utilises PTO it will automatically be compliant. Rioned is currently arranging viewings and factory tours in the Netherlands for customers interested in the new unit. For more information contact Mark Cox on 03300 240404 or email sales@rioned.co.uk.